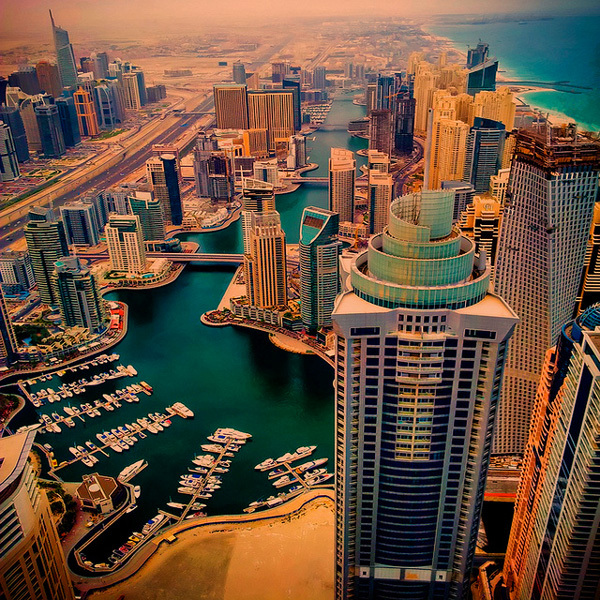 The Dubai Marina is a man – made canal city that stretches two miles along the coastline of the Persian Gulf. A new waterfront was created in order to build the Dubai Marina. This marina is among the largest one in the world. Home of the Dubai Marina Towers, this stunning piece of architecture accommodates tourists regularly with its public, landscaped walkways that stretch for 8 kilometers. Along the waterfront are several restaurants and cafes, and the Marina is often the site of many community events. These events include performances by artists at the Marina Walk as well as the popular Marina Market. The Jumeirah Beach Residence can be found at the Dubai Marina and is a ground level and plaza strip that is home to businesses such as department and clothing stores, cafes, boutiques, gyms and restaurants. There is also a retail complex called the Beach that is made up of four separate plazas containing entertainment facilities and 70 outlets for the sale of food and drinks. Visitors to Dubai Marina will also find its shopping mall with 140 stores and the Reel Cinemas as well. This world famous attraction is beautifully constructed and very visually stunning.